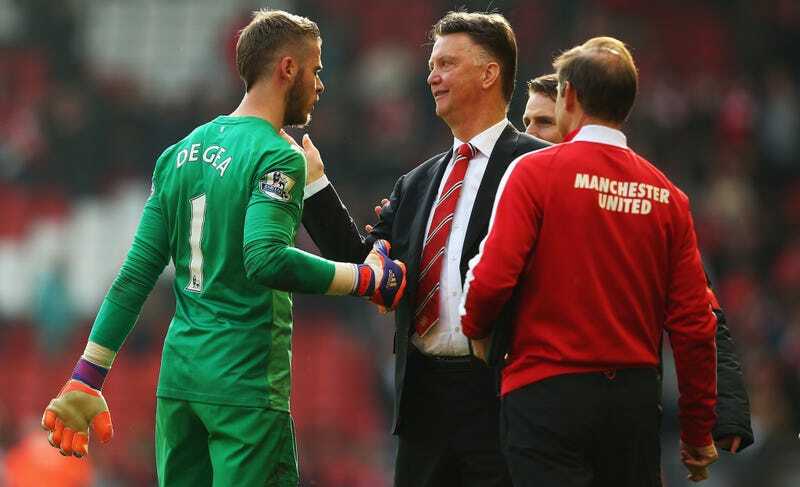 David De Gea Wanted Out Of Manchester, So Why The Hell Did He Just Sign A New Contract? After all of that—after years of speculation and covert contacts and backroom handshake deals and the biggest deadline-day debacle in recent memory—David De Gea has signed a new longterm contract with Manchester United. The first question you probably find yourself wondering is why, after making it perfectly clear that he wanted to join Real Madrid, would he commit to United? The simplest answer is the most obvious: money. The second answer is that his “commitment” isn’t exactly etched in stone. De Gea had been making £35,000 a week, which, judging from the reported figures making the rounds during the recent extension talks, probably just went up a whole hell of a lot. The newest number I’ve seen puts his new salary somewhere around £200,000 a week, which would make the 24-year-old the highest paid keeper in the world and the second-highest paid Red Devil. The salary isn’t the only economic benefit of De Gea’s new contract, either, and those other considerations tie into the fact that the keeper isn’t necessarily pledging his allegiance to Manchester for good. Contracts at this level often include a number of clauses that would result in a financial windfall for the player and his agent should the club decide to sell him. De Gea’s contract could very well include a sizable “loyalty bonus” that United would owe him directly upon moving clubs, and/or a promise of a percentage of whatever transfer fee the club accepts in a future transfer, not to mention your standard signing bonuses and agent fees. And despite appearances, this new contract doesn’t really impair a potential transfer to Real Madrid later; it just makes it more expensive. If De Gea really wants to go and Real really want to bring him there, they can still make it happen as soon as next summer if they want. Sure, United’s position will be strengthened by having him under contract, but to avoid what happened this summer, all Real would need to do is find the price for which it makes sense for United to be rid of the headache and find a replacement rather than go through another window of uncertainty and acrimony. True, it would have been simpler for De Gea to wait for his old contract to run out in the summer if getting to Madrid was his ultimate goal. But there are a number of reasons why big-name free transfers rarely occur. A player that commands tens of millions of pounds in transfer fees knows he’s giving up on those potential loyalty bonuses and transfer percentages if he leaves for free—and sometimes even more importantly, so does his agent. He also loses any economic safety net should he sustain a serious injury (the case of De Gea’s club and international teammate, Víctor Valdés, couldn’t have been too far from his mind when re-upping). Then there’s the ego and status boost that comes along with getting moved for huge sums of money. Madrid president Florentino Pérez knew as much, even predicting De Gea would extend his contract after his club’s bid failed, and was part of what he cleverly tried to avoid with those reported bonuses should De Gea sign on a free next summer. There are literally millions of explanations of why De Gea would believe it to be in his best interest to extend with Manchester, even if he still desires to wind up in Madrid; the same goes for United. De Gea now will earn considerably more now than he would’ve this season, he gets back in the fans’ good graces, and not only can he still end up at Real next summer, he’ll do so with much fatter pockets than otherwise. The same goes for United. The club now steels up their reputation as home for the world’s greats, and should Real come knocking next year, can kick back, smile, and say “If you thought £29 million was enough for this guy in the last year of his contract, we can’t wait to see how high that number has climbed now” while waiting to see if the Spaniards pony up or blanch.